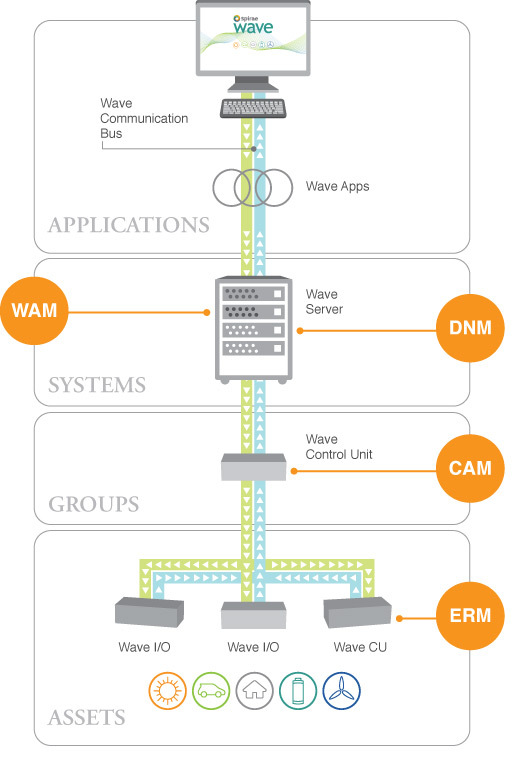 Wave® Apps are managed by the Wave® Application Manager (WAM). Wave® Apps are extensions to Wave® that add business logic to meet user-specific objectives. Groups of Assets are hosted and managed by Control Area Managers (CAM). Groups give Spirae Wave® the ability to aggregate DER into dynamic portfolios assignable to different system capabilities. An Asset is any distributed energy resource that Spirae Wave® needs to know about in order to manage the system under its control. Assets are hosted by Energy Resource Managers (ERM). Spirae Wave® uses a standardized catalog of assets to easily interface with and manage assets. Spirae Wave’s® software processes communicate via a dedicated bus called the Wave® Communications Bus (WCB) that manages transport of time sensitive data. Contact us about our smart grid technology today.